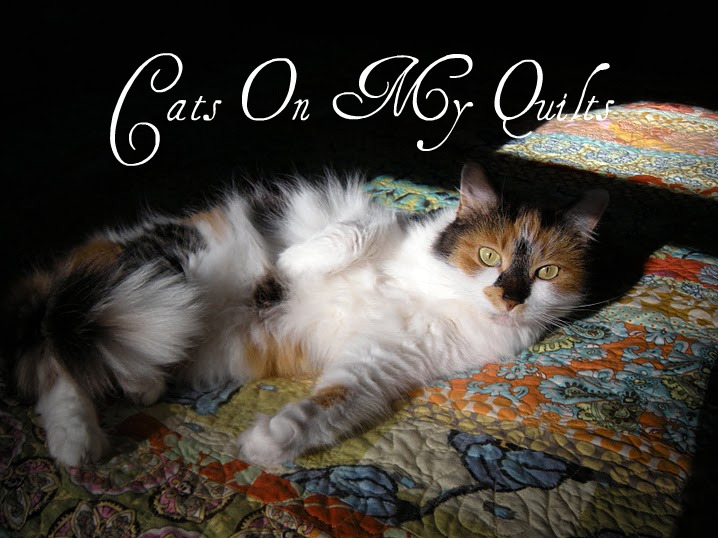 Cats On My Quilts: What Do You Collect? I think all of us have things we collect. I have several but one of my favorites is Blue Ridge Pottery which I have collected for years. 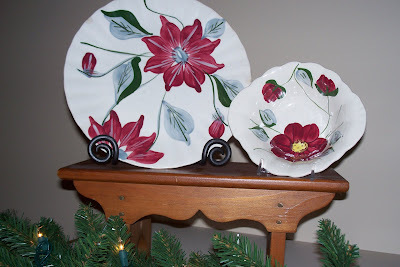 I got introduced to it by my husband's grandmother who had a set of dessert plates painted in a flower pattern that I loved. 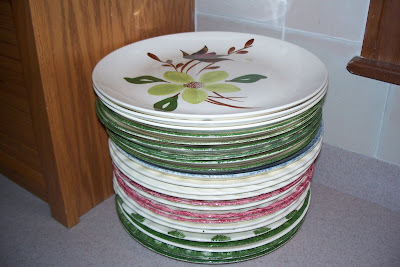 Here's some of my big dinner plates all ready for the 27 people who came to my home last Thanksgiving. I also have plates I use for everyday-all different patterns. I love their cheery patterns and also love that they don't chip easily. Here's a couple of others on display at Christmas. display. Hundreds upon hundreds of Blue Ridge Pottery pieces. I turned the corner and the other side of the display was equally impressive. I then remembered that these pieces were produced in Erwin, TN from the 30's until the 60's just a few miles down the road. I was mentally trying to imagine how much room there was in my luggage but the prices of all the pieces was quite a bit more that the $1 a plate I usually pay. I did buy one small plate that was part of a matching dessert set of 6 plates and 6 bowls. I had recently broken a plate, because even though they don't chip easily, they do break if you drop them on a kitchen floor! I was delighted to find a matching plate. So I'll keep looking at yard sales and such. The hunt is the fun part afterall. So what do you collect? wow! I have some that are very similar to that green flower plate! mine are dixie dogwood, by stetson. That is one great set of dishes you have! i have that habit of collecting dishes too! isn't it so fun to find them! Wow I could easily get addicted to that. I collect Christmas Ornaments. My husband hates that I have enough for two trees. Maybe three. Every year I buy my children one so that they will have them when they move to their own place. That's some display! 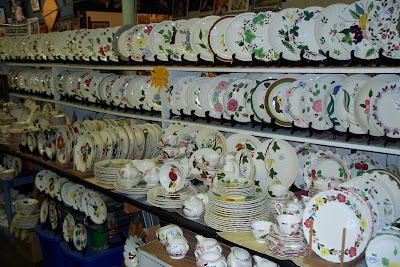 I collect china too, but in my case it is Shelley china. I prefer the Stratford shape but it is quite rare so I collect the Dainty shape too. My collection grew exponentially after I was introduced to eBay! Seems like lately all I'm collecting is dust *s* I don't seem to have an active collection of anything right now - just lots of this and that. I want every one of those plates. And the house to put them in. Aren't they beautiful? 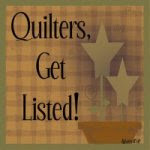 I seem to be collecting fabric, patterns, old quilting magazines, new quilting books, dust bunnies, fabric scraps, wayward threads, and a lot of blogging friends. Life is grand! and those dishes are lovely. These are quite lovely. I don't collect anything quite so useful but my weakness ( besides fabric) is toy sewing machines. A slide show of most of my collection can be seen on my blog. And yes, I agree,the hunt is half the fun! 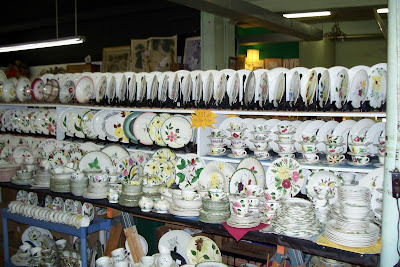 Those are such pretty dishes. I collect tea pots & tea cups. I love to have a nice cup of tea on a cold afternoon. I also collect Angels. My Angels don't come out only for Christmas, they are around the house all through the year. Love your collection of dishes. I actually collect owls, & have shown some of them previously on my blog. I also love pottery casserole dishes, & look out for them at garage sales- usually pick them up for around a dollar each! Beautiful! Collections are so much fun. You never know when you might find that extra special piece you were looking for. It's like being on a treasure hunt. Oh gosh. These are all some of my fav pieces but out here in CA they're pretty expensive and I think I only own some little dessert plates or even something smaller. I love the designs as well and would have died seeing them all there. I didn't even know about this pottery. I collect Americana by pfalgraf....cant spell. They made it for JC Penny and then broke the mold. It is all quilt patterns in a blue and brown....I just love it. But so hard to find any more. Lately it's been old brown Clorox bottles...can't explain why. And I am trying to start on white, enamel coffee pots. Beautiful plates. I collect angels and crosses. Have a blessed day! !